The insignia for a Vice Marshal should only be under the ground forces. While Navy and Airforce officers can attain this rank it is considered a "joint force" type rank. Branch colors do not apply. Hence the rank should only have a red border because once promoted no matter the service they become KPA Korean People's Army officers. Also the star in the rank is a bit different. Yes it has the coat of arms in the center but not those little circles inbetween the points. So no Vice marshal should be on the navy or airforce pages. I am glad to see the additions of ranks for the grades held by Kim Jung Il and Kim Il Sung. However, I have very good color photographs to show that the shoulderboards for each as Marshal of the PRK are the same: the National Arms surmounting the five-pointed star in a wreath. Below this is the National Arms with the plain five pointed star. I have no evidence for a grade in between consisting of National Arms with five pointed star in a half-wreath. 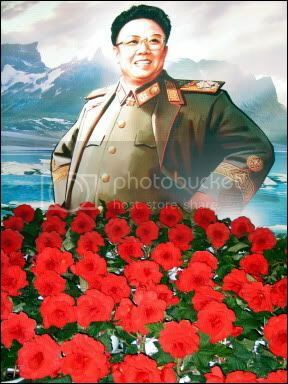 I have a full color picture of Kim Jung-il with the shoulder board with a half wreath. I believe this was created when the last of his fathers revolutionary pals was promoted to Marshal of the KPA. Kim was Promoted to Marshal of the DPRK. This was probably a moot point considering the other guy was like 90 something and Kim was the ruler and really never wore uniforms anyway. Kim rose in the Party structure in the media and propaganda depts. He needed to play the Army rank game just to placate the generals and as part of the propaganda for the rank and file. Kim is like Hirohito, the Army really runs the gov, he is needed to symbolize the head of state. Excellent. I would really like to see the photo if you are able to post it. Often it is so hard to find good photographs and I am glad you have succeeded here. The top one has the half wreath. Nice photos which, in fact, I have seen before. I think if you look closely at that which you feel has a half-wreath, you will see that the upper ends of the full wreath are tucked under the star. In addition, please note that both the collar badges and the cuff stars have full wreaths to match the shoulderboards, which would be the appropriate and logical pattern. I realize these things are a bit hard to analyze in this drawing, but I hope you will agree. The use of a half-wreath is not a very wise idea as it is much too similar to a regular full wreath and will serve to confuse and not be easily identifiable from afar, a cornerstone of good insignia. Does anybody have info about DPRK People's Navy sleeve Insignia? North Korean ranks. I'm having a hard time with the branch devices. They should be in silver on senior and junior officer collar tabs and also on enlisted tabs. This site currently has them in gold, which is incorrect. Anyway I feel these charts more closely reflect the rank insignia used by the DPRK. I'll post the full range of collar tabs once I have silver branch insignia. I have started work on the navy sleeve ranks. Not a ton of information out there though! Last edited by DarthGaddafi on Fri Apr 05, 2013 1:06 am, edited 1 time in total. I'll add some more reference photos soon. 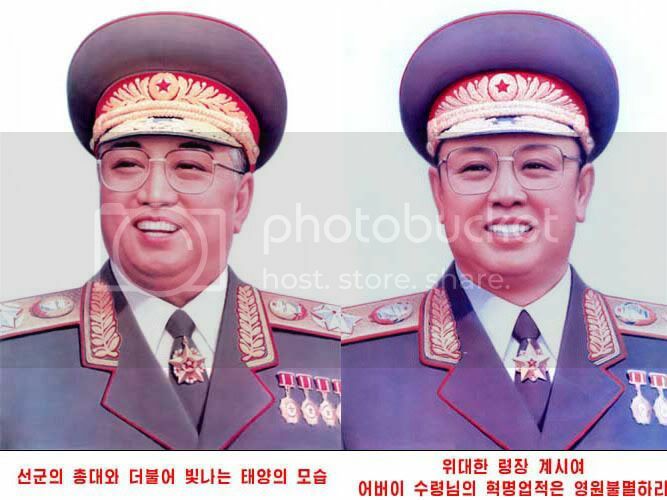 As Mr. Kim declines to wear any insignia it is hard to tell what design of marshal insignia he would/has commissioned. I elect to go with what has traditionally been perceived as the "Marshal of the DPRK" rank. Who knows? Could you please make some branch devices in silver, in the smaller size, and angled in such a way as to look in-line with the stars? Like the blue one, but positioned correctly. 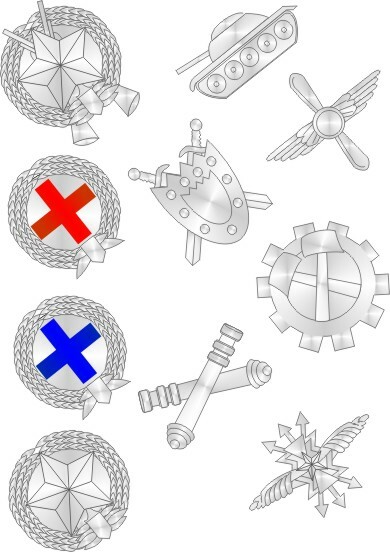 Here is the DPRK's KPAN rank insignia as best as I can determine. I really haven't seen enough sleeve rank to finish that part, but all the rest is correct. BTW, there are NO vice marshals in the navy or air force. Jo Myong Rok (deceased) was a vice marshal and essentially the #2 guy at one point. He wore a regular vice marshal (Army) uniform, but he rose through the ranks of the air force. Some of the insignia on the encyclopedia has filtered over to Wikipedia showing navy and air force vice marshals. Folks are getting the wrong information. Last edited by DarthGaddafi on Fri Apr 05, 2013 5:22 am, edited 1 time in total. Jo Myong Rok was Air Force, not Navy! Was he? Oh ok, I'll correct that; Hmm...who was I thinking? There was a vice marshal that came up through the navy. I will come to me, but good call on my mistake. Yeah. That one vice marshal who rose in the ranks in the Navy was no less than Kim Il Chol, former Minister of the People's Armed Forces. Promoted to Vice Marshal in 1997 from being a Fleet Admiral. Kim ll Chol - right good call. Still, he switched to a regular KPA uniform once he made vice marshal. Is that so ok for you? Interesting site, the guy seems to be somewhat right and somewhat incorrect. Hard to tell as I cannot translate the language clearly. Nice find though! Obviously the encircled star on the navy sleeve rank extends to more of the junior officers than in the persons chart because we can see a regular "O-6" captain has one above his stripes in the photograph. I think we are all clear on the vice marshal and marshal grades. Until Mr. Kim III decides to wear a rank insignia we do not really know what the iteration will look like. I hope the encyclopedia will be updated soon to correct. I finally was able to make improvements to the collar ranks of the KPA. These with the silver branch devices are the current style. Nice close-up on general officer collar tabs. You can just see the zig-zag under the stars. As far as I know, the earlier insignia (1948-1952) is corresponding to a position taken by a person, and not to a special rank.